With the federal budget deficit reaching $779 billion, President Donald Trump is asking Cabinet members to cut spending in their departments by 5 percent next fiscal year. Because such trimming is hardly slashing the total budget, however, some experts question whether that even will make a difference in fiscal 2020, which will begin Oct. 1, 2019. The national debt is more than $21 trillion. 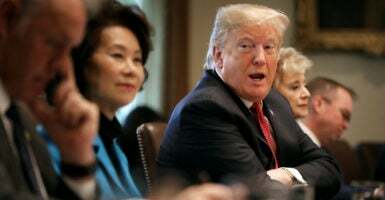 “We’re going to ask every Cabinet secretary to cut 5 percent for next year,” Trump said Wednesday during a Cabinet meeting. Congress approved an increase in the military budget to $716 billion for fiscal 2019, but there will be a cut, Trump said, “probably” to $700 billion, for fiscal 2020. 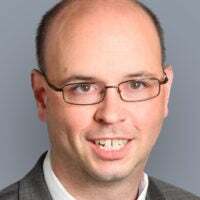 Given the $779 billion budget deficit, and a 13 percent increase in discretionary spending from 2017 to 2018, each department should be able to cut 5 percent, said Justin Bogie, senior policy analyst in fiscal affairs for The Heritage Foundation. Federal spending is also set to increase by more than 3 percent from 2018 to 2019. Congress and federal agencies should adhere to the 2011 Budget Control Act, which limits the growth in spending, Bogie said. The president acknowledged that some fiscal hawks likely won’t believe a 5 percent cut is enough. Such a cut is achievable, since government spending increased by 16 percent in the previous two years, said Maya MacGuineas, president of the nonprofit Committee for a Responsible Federal Budget. Something will have to give if we stay on our current track. With trillion-dollar deficits returning in as soon as a year—indefinitely—5 percent budget cuts to a small portion of the budget will pale in comparison to what will be needed in 15 years. Thoughtful reforms phased in now over time will be much better for the American people and economic growth. Presidential budget proposals rarely are enacted by Congress. Some Cabinet members previously ran large organizations and will have some expertise in managing waste, said Tom Schatz, president of the nonprofit Citizens Against Government Waste.